This prestige rice cooker has a capacity of 1.8 liter. It has look & cook glass lid. This prestige rice cooker is an indispensable kitchen appliance to own. 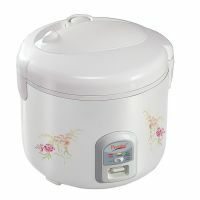 This prestige rice cooker comes with entire menu which Cook porridge, soup, stew, pulao, idlis, steam vegetables in a convenient and hassle free way. with features like speed cooking, keep warm etc. To Recieve updates and possible rewards for Prestige Delight Electric PRWCS 1.8 please sign in. To Recieve updates and possible rewards for Electric Rice Cooker please sign in.